The Standing Stone: “Standing stones are symbols of authority, boundary markers, and monuments. As objects of power and balance, unyielding and strong, blending earth and spirit energies, they once formed a meeting place where people in a community could decide issues and settle individual disputes before the gods. In this circle of smaller stones, smaller stones, a community council could sit in arbitration or discern justice, hearing evidence and rendering a decision. The tradition of engraving stone obelisks and tablets with the laws of a society relates to the power of the megalith and here symbolizes concepts of Craft practices. 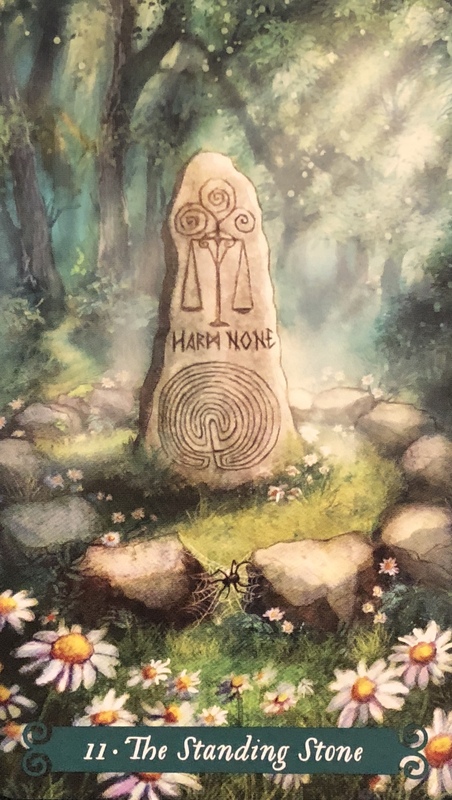 The stone has been carved with the triquetra symbol of the Triple Goddess, the scales upon which the facts of a matter can be weighed for a balanced and impartial decision, the Craft ethic of ‘harm none’ for fairness and compassion, and the labyrinth signifying the path one must follow to reach the heart of the matter and find the truth. The path leading to this circle of stones passes through the dark forest, and yet the light of truth shines through the trees to illuminate the stone and ensure that the truth shines through the trees to illuminate the stone and ensure that the truth of the matter will be revealed. Objectivity is emphasized when this card appears in a reading. The Standing Stone shows that one has gathered information and fairly evaluated a matter, and may therefore trust the decision reached. When paired with the King of Swords, this card indicates a legal matter or court decision. The level of success in this issue may be revealed by the surrounding cards. This is a message of facts and of the laws of Nature. There is no getting caught up in emotion here, of succumbing to the victim mentality or of drowning in our sorrows. There is also no room for falsity, bravado or deception. This is a message of truth. Justice will be served. The equation is karmic, mathematical. The jury cannot be swayed with tears or false promises. Boundaries are in place. Intimidation is not possible. Truth is critical, vital. Make your decisions based on the Highest Good and they simply cannot go wrong. Create from a heart centered place, but not emotional. There is no need for retribution, only for fairness and equality here. The only way out of a current dilemma is through the truth. The mind plays tricks but the heart will lead you with honour. Where I live on Vashon Is., Wa. There is someone who has applied for a permit to devastate a natural beach area, home to sea life, dozens of bird species, otter, seals and other wildlife, for profit. I and other islanders are hoping to stop this progression and save a small but beautiful part of the Earth. This card is a good one for today.